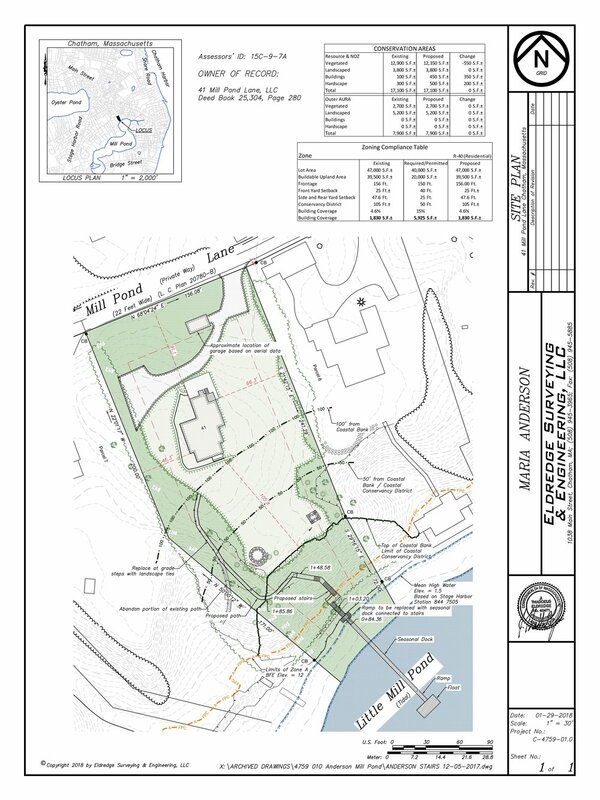 Revised Plans - After the first review with the Conservation Commission, there were several recommendations for review with the clients. - Remove the path and revise the stairs to take a more direct route to the lawn. 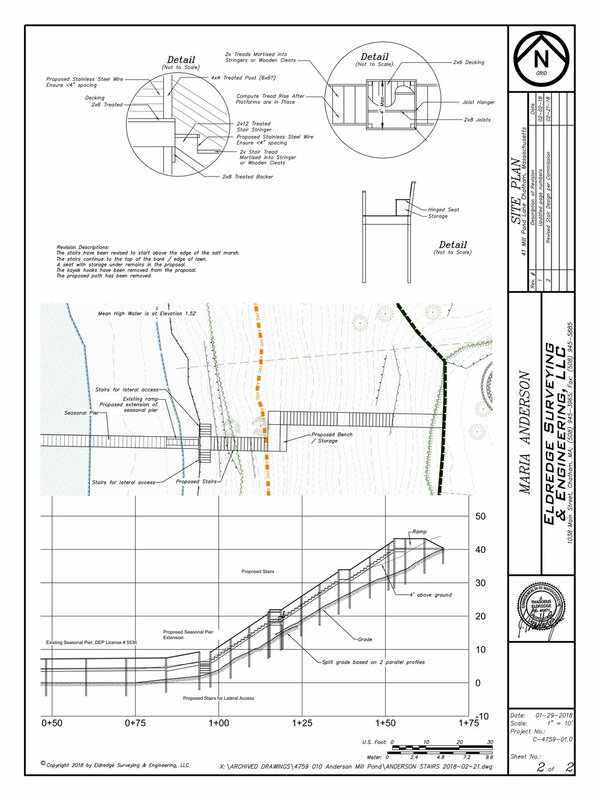 The proposed section of path was removed and the stair design was modified to take a more direct route. This does result in some portions of the stairs being less than 4' above the grade which is a policy and not a requirement for approval. Every effort has been made to keep the stairs elevated. - Revegetate the old path. The clients would like to keep the old path. It will be revegetated at the property line but as this has been a multi-generational home, the nostalgia is important to the family. Further, with many Land Management Plans, we often see clients return with the desire to place a path into the lands they are paying to restore. The proposal to replace the steps within the path stands. Given the restoration proposed, if the path starts to be unused in the future, the vegetation will reclaim it. - Remove lawn at the top of the bank. This was considered but the main goal here is to restore the non-native species on the bank and gain a better access to the seasonal pier. The applicant is not currently proposing an addition or other alteration to the house and while there are no immediate plans to do so, because mitigation banking is not a given, the applicants are reluctant to give up any more potential mitigation. - Reduce the stair footprint including the landing / bench and kayak rack. The new design reduces the small landing depths by 8" and reduces the lateral landing. The larger landing has been reduced in size but the applicants would very much prefer to keep the storage bench. This will provide the elderly members of the family a perch to watch the younger family members swim, fish and boat off the seasonal pier. This bench has been located in the shade of a tree and the Land Management Plan has been revised to include the request for minor pruning of these trees to ensure views from the bench to the Little Mill Pond without taking too much from the trees themselves. - Modify the plantings. This will be addressed by Jen or Nick Crawford at the hearing. Nelson Roper - These are some similar projects permitted last year.